To my delight I found a baby raven in Lincoln Park (West Seattle). 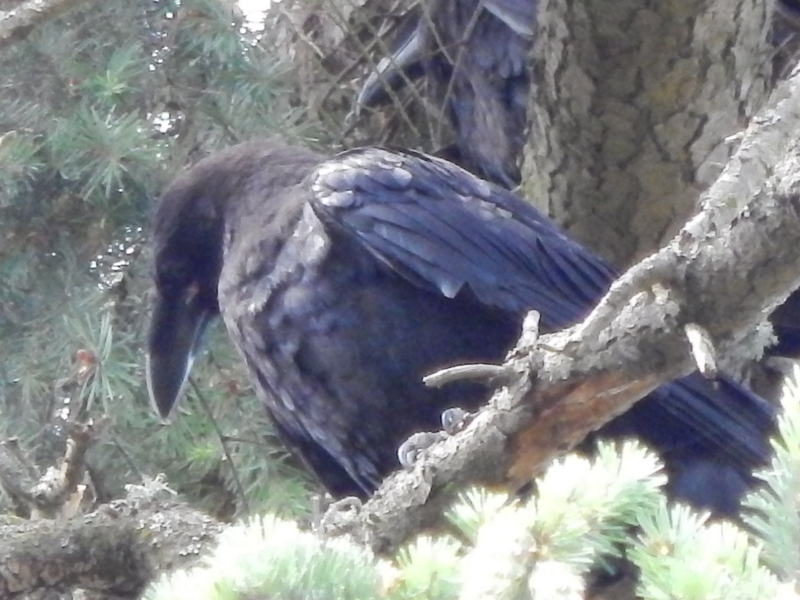 I heard from someone I met on the trail in Fauntleroy Park that there were ravens in Lincoln. This was the second time someone told me that in the last week or two. Ravens are not known to come down into the urban Puget Sound area. They are found in the foothills and in Eastern Washington but certainly not in Seattle. That makes this news even more special. So, I walked over and listened for the tell-tale sound of ravens. They have a deeper chuckle rather than the brassy caw of a crow. After wandering around I heard a chattering type chuckle. My brain went… Baby Raven!! It did not have the usually baby crow high pitched momma momma caw but he had a deep bass clucking sound. 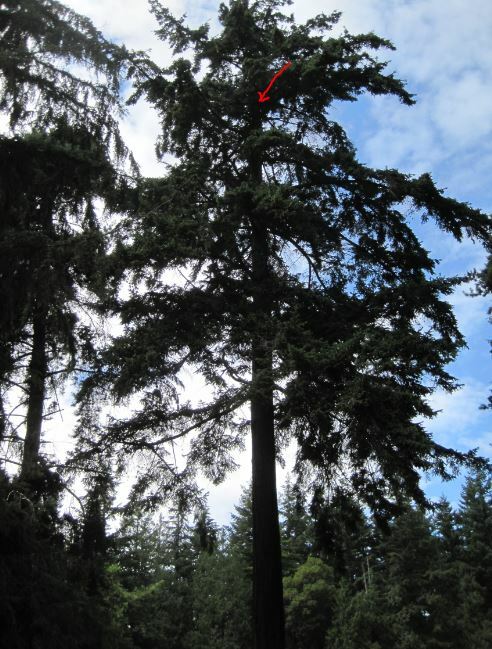 I pinpointed the tree and then started to circled it with my binoculars. Sure enough there he was very high up in the tree with another raven. The red arrow on this picture shows how the naked eye couldn’t have found him. This other bird could be another baby or parent. It is very hard to tell from this distance. Here is a short video so you can hear his baby babbling. Another identifying thing that makes this baby a raven instead of a crow is the size of his chin ruff and the heavy long beak. This picture shows you his really big schnoz. Plus look in the background and you can see the other raven just hanging out. I did some research on ravens in this park. They have been hanging out for a couple of years and last year another bird watcher caught a baby on video. Enjoy!! Remember to leave your technology in your pocket. Look up and listen for sweet moments like this.